Pace® Salsa Verde is a Southwestern sauce that can liven up any dish. 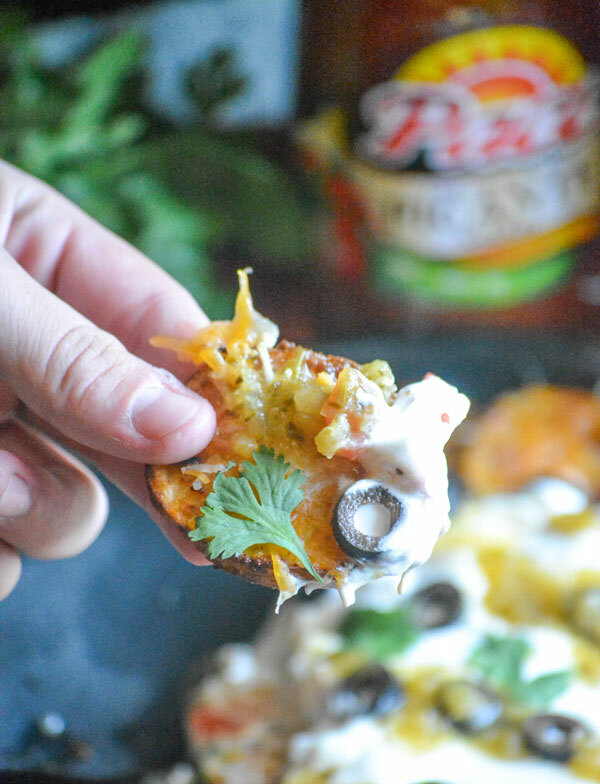 Poured over a bed of Tex Mex Pub Style Nachos, it’s a match made in Game Day heaven– and sure to be the MVP of your party spread. It’s that time of year again that so many of us live for. Football is back in season!! That means a grocery list a mile long for everybody’s favorite ‘home’-gaiting favorites, and a trip to my local Walmart to stock up on ’em all. It’s something we look forward to planning and even doing. Looking forward to a trip to the grocery store. Can you imagine it?? It’s true though, folks. It’s not the only thing we look forward to this season either. The hubs and I love spending Game Days together. I’ve discovered however, that as our kids have grown it’s become even more fun to share the view from the family couch with them. All in! All of us gathered around the big screen, clapping, hollering, bad calls, good plays and all. Maybe a few of their teenage buddies thrown in for good measure. My husband and I show up because we love everything about the ritual. My teens? They show up because they love the game, and (even though it’s gonna be about 10 years before they admit it) that unparalleled QT with their Daddy. Their friends? Pretty sure they show up just for the food. And I’m not even joking. And no game day would be complete without a spread of good food. Speaking of good food- no game is ever boring, so why should our food be?? Let me hear a cheer for ‘Ban The Bland’! Every game comes with the standard bowl of tortilla chips and our favorite Pace® Salsa for dipping. But what if I told you that it can be so much more than that. It’s not just for dipping anymore, folks. 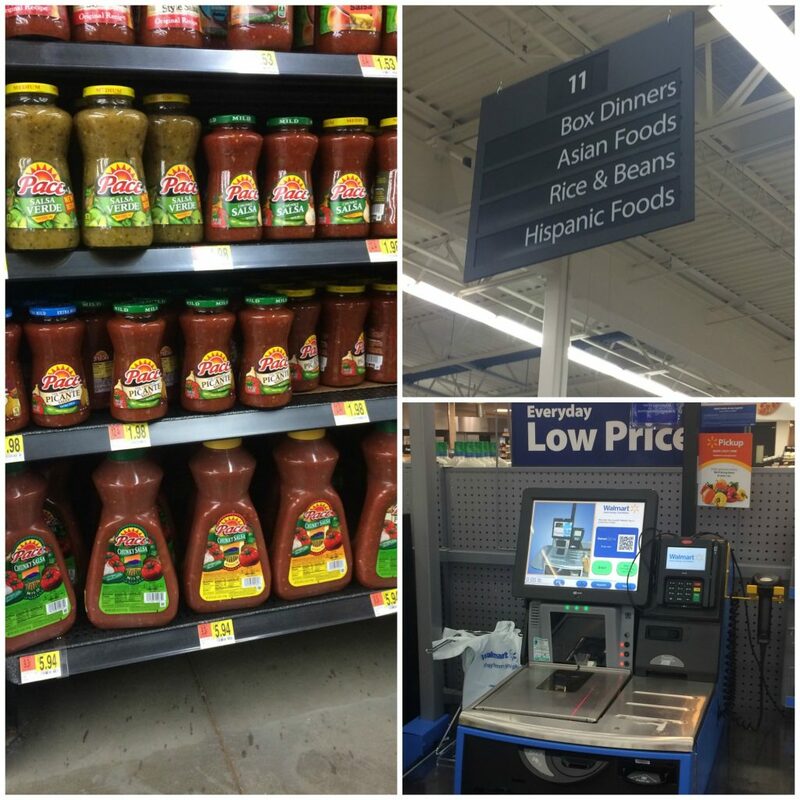 It’s tried and true Southwestern flavor in every bottle of their variety of salsas. There’s a heat level, and consistency, just right for every fan. Just imagine the possibilities when you take it from the dip bowl, and consider it a condiment or even an ingredient. Talk about adding a bold kick to your cooking. It’s something I’ve gotta have as a key ingredient to a successful smorgasbord for every game. As a matter of fact, with it’s new recipe- I couldn’t wait to use 24 oz. Pace® Salsa Verde in my latest and greatest idea. Of course, I also have to have the 24 oz. Pace® Picante Sauce on hand for our staple tortilla chips. 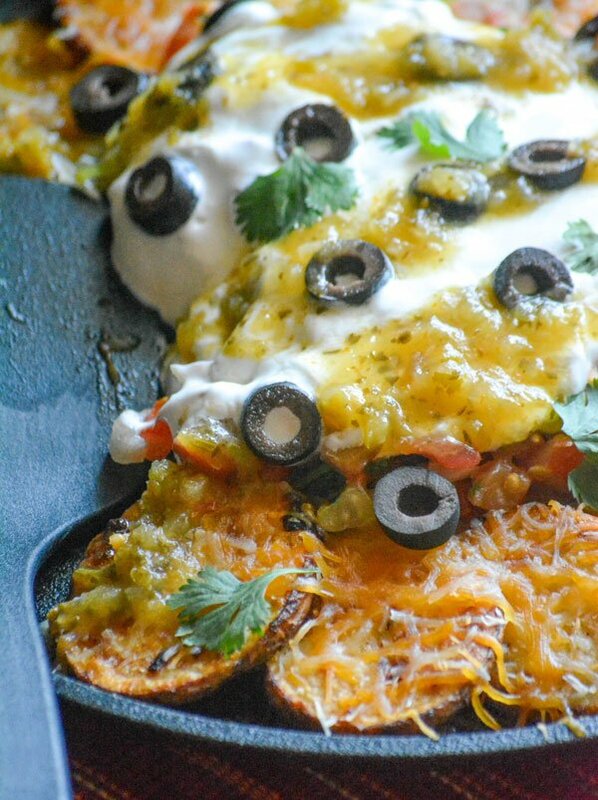 The focal point for our football spread this year, without a doubt, will be these Tex Mex Pub Style Nachos. 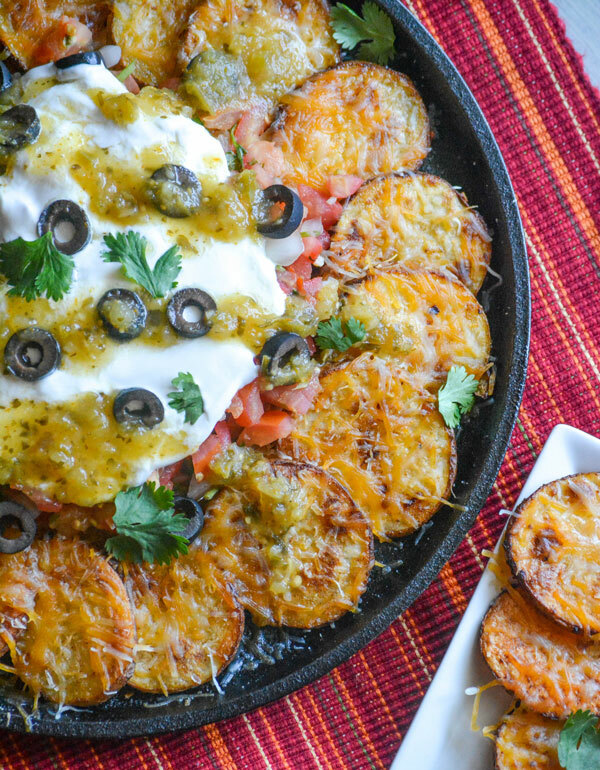 Crispy, roasted slices of potato are loaded with your favorite fixin’s– sour cream, pico de gallo, black olives, plenty of melty cheese, and finished off with a liberal drizzle of Pace® Salsa Verde. 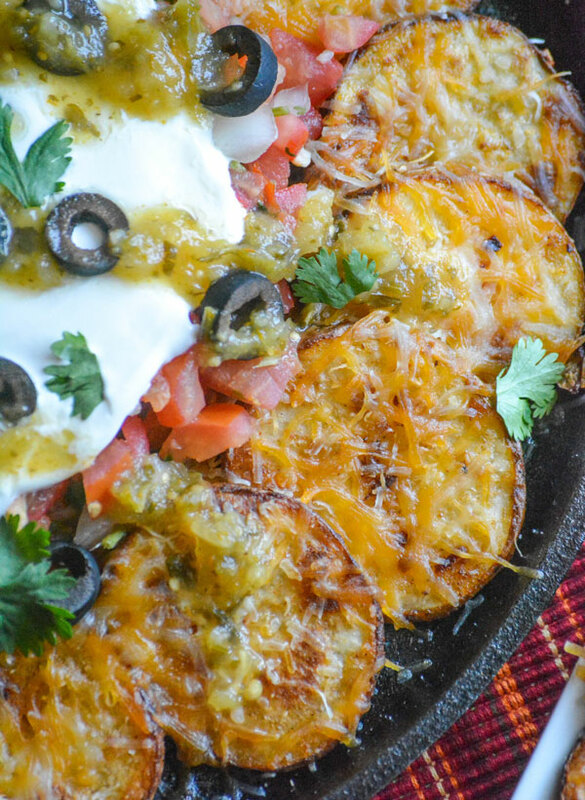 The flavors blend perfectly into a yummy Tex Mex dream come true, delivered on a bed of thick, crispy potatoes that can actually support it’s weight. Even on the days when certain players (whom we won’t name publicly) can’t, under game time pressure. 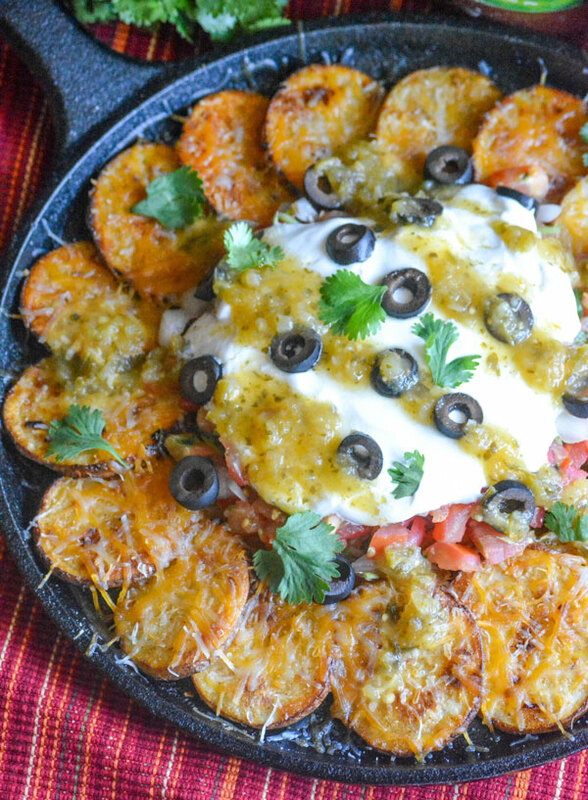 These potato based nachos feature some of your favorite Tex Mex toppings, making them perfect for serving at any get together, but especially your game day buffet. Use a clean dish towel to dry up any of the excess moisture, from washing the spuds. Use a sharp knife to slice them into 1/4 inch thick coins. Add the potatoes to a large mixing bowl. Drizzle the potatoes with olive oil. Add in the taco seasoning, cumin, salt, and pepper. Use a spatula to toss them to coat, gently but until all the spices and oil are evenly covering all the potatoes. Spread the cheese out evenly over top. Bake another 4 minutes, or until the cheese is melted. Remove the skillet from the oven and let the potatoes rest for a minute, too cool slightly. Top the center of the nachos generously with pico de gallo. 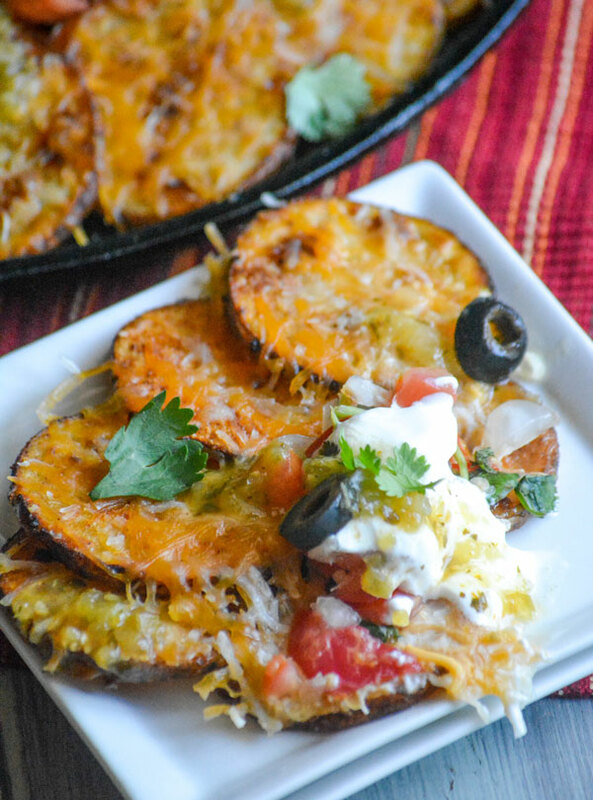 Serve them with a scoop of sour cream in the center, sprinkled with black olives, a generous drizzle of Pace® Salsa Verde, and a handful of cilantro leaves on top. How do you do game day? What great ideas do you have for amping up your appetizers with Pace®? Get recipe inspiration here.